Fort Smith Arkansas. Killing a bit of time before going back to the hotel. Walking around taking pictures on Garrison Avenue in Fort Smith (see previous in series). 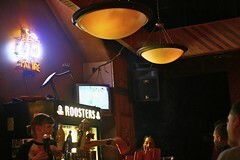 It starts to rain a bit so I dash into the one open pub – Roosters. The rain picks up a bit, but being from Houston I respectfully submit that I am more familiar with rain than the folks in Arkansas. We live in a swamp that got paved over for heaven’s sake! So there I am at the bar drinking a bud light. Listening to the locals and … well doing nothing. A guy comes running back into the bar and hollers “Man, look at that!” referring to the rapidly picking up wind. The door to the bar being pulled open and the rain went horizontal in less than a minute. The speed was scary. Next PostNext “Pimp My Non Profit” Panel for SXSW 08 Makes the List!